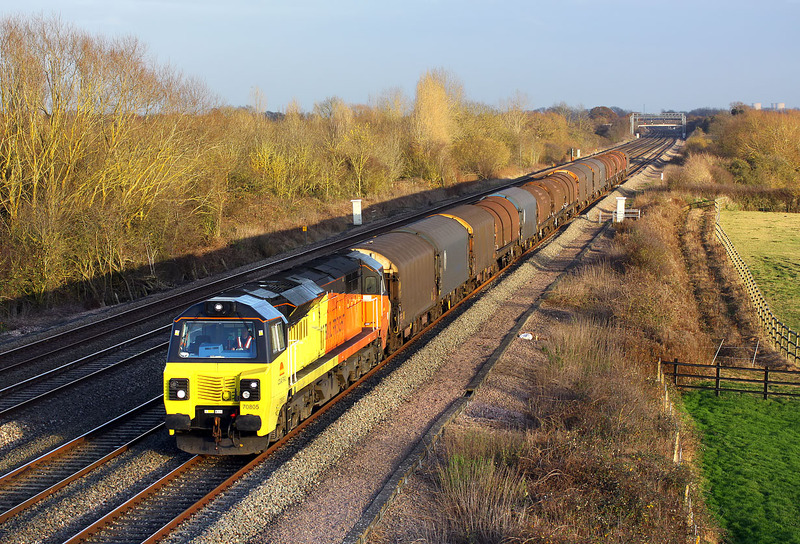 With the three remaining cooling towers of the disused Didcot Power Station visible in the background, 70805 runs along the down relief line at Circourt Bridge, Denchworth on 3 December 2014 with the 6V62 11:22 Tilbury Riverside to Llanwern steel empties. There had been considerable cloud at this location during the previous hour, and I really didn't think this would be in sun. However, at the last minute the clouds parted enough for some decent light. This is the first occasion that a Class 70 has worked this train throughout. The two previous occasions both involved a second loco, with the 70 added for part of the journey. In the case of 60087's first outing this was unfortunately due to the loco's failure!